This passing year, through the nonprofit that I created, Florida Disability Access and Awareness Foundation we opened hearts and minds and made the news with our wheelchair challenge. There's only one day left to make a tax deductible donation this year. Check out the news clip below ! It's not a huge organization, but I have a lot of passion for it. It's not simply a cause that I picked up: Disability is something I've dealt with all my life. I wanted to do something to change the way people think and feel about people in wheelchairs, about people like me. And I haven't really seen anyone else trying to either. I think with some resources, with your help we can really make a difference. I see this Foundation for what it could be, for what it could do- and that excites me. I know a lot of organizations ask for your support. Please give us a chance to make this dream a reality. A few days ago I got to revive my old laptop that was with me for most of law school days and Bar Prep. Our grant writer needed a computer to work on, nothing fancy just something that powered up for her to use as a glorified typewriter and I had this thing sitting on a shelf gathering dust. It was a Lenovo X61- a convertible laptop with a screen that turned around when I needed to take hand written notes with a stylus as I rested the machine against the edge of my desk like a copybook. Aside from the hard drive that it refuses to boot from and the battery that only holds the charge for sixteen minutes, the machine still works, probably because I remember paying more to have it upgrade it and customized. And I have to say- as odd it is- I miss it. It was the most fun I've ever had with a laptop. It felt well build and sturdy, had a certain weight to it, but at the same time the keyboard was petite and not taking too much space in my lap. I think I was the only person in America who liked that strange red joystick pointer button placed between the keys, that eliminated the need for a touchpad. I liked that - at the time- it felt light, that it didn't take much space, that it had an ultrabase it snapped into but that I mostly left behind. I bought two stylish carrying cases for it, one was made of genuine leather. It made me feel like I've had something of really high quality and I took it everywhere. Class, exams, getting food on campus, the bag was always with me resting on my lap as I wheeled through the city. Two or so years earlier my brother bought me a widescreen Sony Vaio, which I think he still believes was a better choice for me, and I got the Lenovo when it stopped to power up a month after the warranty expired. It was 2008. As I took it out last week one thing came to mind. How it the world was I ever able to carry anything so heavy? No wonder I was so slim and strong back then! And I really struggled as I was bringing the machine to a local pub for the grant writer to pick up. It could be that I now use a lighter wheelchair: My old one, Kuschall AirLite was made out of Titanium, the new one- tiLite seems to be some form of reinforced aluminium and is noticeably lighter - maybe it had a better weight distribution. And the bag was almost as heavy as the laptop. Who ever conceived such a thing? One of my Board Members later pointed out that it wasn't designed to rest on my lap, although I've done it like that for years. She explained that when it hangs from your shoulder you don't really feel the weight. Wouldn't it be nice if somebody designed a laptop and a carrying case precisely for wheelchair users like me? So it wouldn't feel like it's going to fall off because it's too light, but then wouldn't add to much weight in the front? So it wouldn't be too bulky or too small and above all- be functional, comfortable and stable. I've decided to replace to hard drive but the next challenge is getting the system back. Back in 2008 I bought the student version of Windows 7 with a lifetime option of digital download from a vendor called Digital River that doesn't seem to be in business anymore. It's rare for me to say that a reporter did a good job covering my story, but I'm really happy with Angie Angers' work on the Wheelchaired for a Day segment. The young reporter from the local CBS affiliate explained my motivation for launching the project in a clear and approachable manner. She talked about the foundation, informed the viewers about how they could donate and participate. Dealing with journalists over the years has been a mixed bag. They either overwhelmed their audience with too many details or haven't said enough. This on the other hand- works. I really like her narration. In fact, when reaching out to potential sponsors and supporters lately I've been using her clip lately. It touches upon all the important elements and ties them together in a way that make sense. If only I wasn't there looking angry, speaking over a power drill, with my hair fighting of the wind. Thankfully I was only there for a few seconds so I skip that part. This might not be a big deal, but it irks me because it shows how little consideration for the needs of people in wheelchairs like me goes into planning in Gainesville where I live. I don't know if it's temporary or permanent and if it's caused by the expansion of the Butler Plaza shopping area, but the bus drivers of the bus route 1, that I usually take to buy groceries on Sunday are now told not to wait on passengers by what used to be the last stop on the run, but to go round the corner and kill time there instead. On both ends, drivers usually sit there for a few minutes before they head back out again. You may ask: what's the difference, it's only a short walk away? The old stop had a shelter. The other is a rod in the middle of grass, and what's more important to me- it doesn't have a sidewalk. I've seen people running for the buss across the grassy area just to make it. I can't do it. I can't roll off a sidewalk and go through grass, even if the driver can wait that long. They do wait for 5,10 often a few minutes especially on their last run. So, it does feel at times like the bus is mocking me. It's there, so close, but I just can't get to it. And I guess it's not a big deal. Most of the time I have 30 minutes to wait for the next one - and it will stop for me if i get to the usual shelter five minutes earlier, because it does go through there. But it doesn't leave you with a good feeling to know that there's yet another place you can't get to. That people can run for it, but you have to wait. And I'm sure there's a lot good reasons for it: safety, narrow roads, traffic. But what I want to know is how come we still have bus stops without sidewalk access, in the middle of a road or grass. All through law school I used to go to Starbucks almost every day. Grab a cup of a white mocha in a "for here" mug and spend hours reading for class or studying for exams. Now I live across from their store in downtown Gainesville and you might be surprised to know- I don't go there that much at all. I'm a huge coffee drinker- although not as much as I used to. Its proximity was a huge selling point when I was picking out apartments and I still have meetings there from time to time because it has tables and chairs and it's a location that everyone knows. The store changed - quite literally- and with the updated feel it is I who doesn't feel comfortable there anymore. Few months ago it underwent some extensive remodeling. I was actually exited to see the finished product. It may look stylish and sophisticated and it even serves wine. In the process, with all the sitting areas and new furnitur,e it forgot to at least try to be wheelchair friendly. And I know it's probably not a concern for them. I doubt wheelchair users storm Starbucks locations daily to get coffee, but it matters to me. Coffee is an indulgence not a necessity and I tend not go where I don't feel welcome unless I have to. And if the most prominent area of the store is a high bar with stools, you know it feels off limits to me. Everything is out of reach. I'm now far more limited to where I can sit with my cup. With the couch closer to the door placed in front of some smaller tables and some tables on the sides, the shop feels like a maze that I have to navigate with small isles between the stools and chairs. I can't even roll from the door the door to the registers without waiting on someone to scoot over to let me get through or having to move their backpack off the ground. I could go for the table by the couches, but the isle is to small to face it, there's no room- so I have to position myself sideways. I can only use it as a side-table. It doesn't make me feel comfortable. Everything is higher and feels more crowed. Whoever approved this style clearly never had to use a wheelchair. I miss the times when the floorplan was more open and inviting. Because for me this was not it. I felt rushed. Even as I was able to claim some piece of a table top to rest my elbow on I felt constantly in the way. Unwelcome. Unwanted. Not fitting in with whatever "modern" design Starbucks is going for as it transitioned from a coffee chain to "everything for everyone" type of franchise. I hope that it realizes that in turn it may disfranchise people like me. And I must say, As I ate my food and drank my cappuccino facing the side of the room I kept thinking how much I'd like to sit with Starbucks executives, tell them about the work we have cut out for us at the Florida Disability Access and Awareness Foundation, the need for more inclusion, accessibility and empathy. 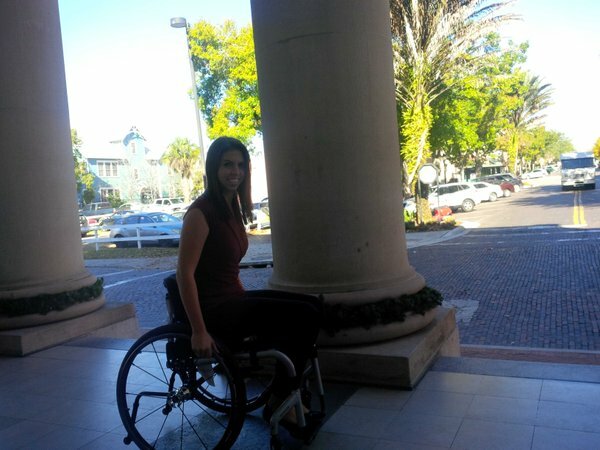 On Monday morning, Angie Angers, a reporter from a local CBS affiliate, GTN decided to spend 24 hours in a wheelchair. Just like in August we partnered with one of the biggest equipment providers in the country, Numotion- although this time they gave us (and her) a different chair for a day. A light sports model that doesn't even fold. Angie seemed to have the navigation figured out pretty quickly as she went down and up the Hippodrome Theatre ramp both forwards and backwards, but her "left" and "right" was still a bit confusing. Her initial idea was to be in the wheelchair for a day like all our other participants earlier in the year and then report on her experience on local news. Here's what's brave about it. She was eager to do it. Her managers were excited for her to do it. And we were ready to go. You may ask, why is it such a big deal, it's just a wheelchair. 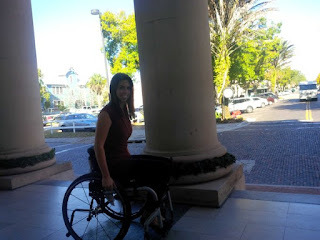 But if you consider that reporters from the competition (ABC affiliate WCJB and student-ran PBS station WUFT) were expressly told no to sit in the wheelchair, not to try it, not to pose with it, Angie's determination gains a new dimension. Where other stations focus of not offending anybody and tried to stay clear from making viewers uncomfortable and misunderstanding the point, GTN went for it. Yes, they will be tactful, yes, they will explain the motivation. But there are always risks of someone seeing this as mockery. Because disability and everything that comes with it scares people. To me- my wheelchair is a tool. It's an accessory. It allows me to be mobile. And it looks great. I don't project my fears, reservations and despair onto it and you shouldn't either. The types of reactions that we've gotten from the other stations was precisely the reason why we continued with the project and why I want it to spread. To challenge how people feel about disability. How it's them who make awkward things that shouldn't be awkward and how a wheelchair becomes this sacred object with magical powers it was never intended to be. Some people use wheelchairs others wear glasses and we are all the same. And I will continue with projects like these until people continue to be weird about it, quite frankly. The more you fear it, they less likely you are to explore and learn about it, and we need to start having the discussion on disability. There was never a more pressing time to talk about wheelchairs and their roles in our lives. From Kylie Jenner's Interview wheelchair photoshoot and even more bizarre backlash to changes in Medicare that will cut equipment reimbursements- the general public would support measures to address it but it doesn't understand it - and therefore it doesn't care. We haven't found the right model to talk about these issues and getting people interested and I'm doing my part. To me it's obvious that it has to start with people understanding wheelchairs and their users first and figuring out how they feel about it. To get there - they can't be scared of the chair or the conversation. Later today I received information that GTN decided on a different angle. Some of the other managers became concerned with the story reported from the first person perspective. At first I thought it meant they got scared and don't want her to be in the chair, but that's not the case. She is still filmed in it and goes about her day. Just not on the news. For her to be in the story someone else would have to report on it, so she decided instead to build her report from the video collection FDAAF already has and then talk about Foundation's mission, wheelchair issues and what is the idea that I'm pushing rather than a summary of Angie's day. GTN staff will give us videos of her experiences that you will access on our website hopefully this week. How do you tell someone that what they do is offensive to you? That they hurt your feelings even if that wasn't their intention? Even if they don't know any better? Even if in their own mind they're doing something good. And, no doubt-- are themselves good people. How do you not kill that enthusiasm, that spark to help people, however misguided? And how do you not feel bad about yourself for saying something, because everything you say always comes out wrong? There's a middle woman that I see walking her large dog around my apartment complex often. I think she lives in the the area. We cross paths when I get yo my bus stop and I wait for her to pass me in the sidewalk because dogs an wheelchairs don't mix. We often nod and smile as we go about our own ways. She seems like a nice lady. Last Sunday she chased me across the street where I was waiting for my bus and she insisted I take a dollar she was holding in her hand. When I declined, she made that gesture with her hand, the "c'mon, take it" encouragement. Here's what upsets me the most. When you do that, you instantly assume a number of things about me. It's not simply that you are better off than me economically, which would be bad enough. Yes - you assume that I'm homeless, that I'm in trouble, that you are in a position to help me without even asking if I need any help, that I'm some kind of nuisance, you can throw money at,that giving me money can make you feel better about yourself not being charitable or kind or understanding or giving enough. I didn't go to law schools around the world for then years just so I can panhandle in Florida. The most upsetting part is that you think you're better than me. That you don't think I had value. And then that I'm something you had to deal with. The problem with that lady was that she hardly spoke any English. She seemed Latin. And it got me thinking as a Spanish speaking construction worker at the Reitz Union attempted the same thing a few weeks prior- maybe it's a cultural thing. Maybe this is how they were raised, maybe this is how they react to people in wheelchairs in their part of the world. Doesn't mean that it was the right thing to do and that wasn't still offended. Because I can be a lot of things to reach higher and be bolder. I can be more educated and I work harder. But I can never not be in a wheelchair. Last night, the same thing happened - only with Americans. I was out to throw some papers for a client into a mailbox. Instead of getting upset I told them I was a lawyer, and they were really surprised, because it was probably the last thing they expected to hear. He explained, he likes to help who he believes to be "less fortunate", but didn't mean to "offend". And I said calmly that it was still pretty hurtful whether it was his intention or not. I was out of my business cards, which he was eager to get, so I sent him to visit my blog. And I told him that the nonprofit I founded, Florida Disability Access and Awareness Foundation was created precisely to deal with these kinds of attitudes. If he feels bad - he should donate to it. We talked a bit and laughed a little. "Maybe I should make you feel worse about it so you gives us more money" I joked as we parted. But I know on some level at some point I'll need to come to terms with the idea that this is what people think, deep down. . And I don't think I ever should. - To work as a disability clearing house by putting together a portal first in Florida, then beyond. We'd collect information on accessible buildings and areas, certify businesses as FDAAF approved on different levels, feature inspiring individuals with disabilities and stories of those who want to try their day in a wheelchair. - A video is worth a thousand words. We have seen how we can change attitudes if we simply put people in a wheelchair, and then turn the camera on. In August we've spent an entire month giving business owners the wheelchair experience. This is a project that inspired me to refocus on our mission, reenergized me and reassured me in what we were doing. I'm confident it needs to continue. To me, it's a very personal cause. But I'm limited to how much I can do. I dedicated a lot of my time and money to make this vision come alive, and we're closer. But we do need your help. The harsh reality is that while we can lean on student volunteers to help us and they're eager to join and to learn- anything from t-shirts to pens and brochures cost money. We could do so much more with public support. We also hope to reach out to corporate sponsors- we can really make a difference together and reach out to a group of proud, independent, ambitious, driven people that are often overlooked. Please email me at rstrzalkowski@fdaaf.org. 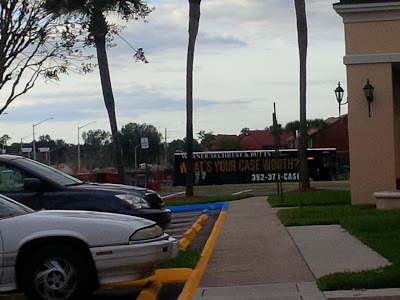 Here's a bit of a good news: The bus system in Gainesville, a Florida city where I've lived since I moved to the States from Poland now offers service on most holidays. To someone who drives or even walks this might not be a big deal, but to me being able to get out of my apartment and have an adventure has always been something extraordinary. Seeing empty parking spaces, with most of my favorite shops closed and friends leaving town, watching neighbors rushing, having somewhere to go is always bad enough. My independence and my self assurance were fueled by my ability to experience things. This is why it was in America that I finally felt free. I could get on a bus, go anywhere and experience the world. Yet around holidays- bee it Veteran's Day, Martin Luther King Day or Christmas I'd be stuck again. In my apartment, by myself, waiting for the ordeal to be over. Sure, I'd tell myself that it didn't matter. That I can watch TV, catch up on my reading or order something extremely unhealthy, typically the night before- because some of the delivery services celebrate too. But no more. No more wondering if I have enough food ordered in to last me a weekend, no more binge watching bad TV or eating junk. No more thinking I need to leave a New Year's Eve party early and get a ride from a kind stranger. Now I can just get on a bus in the morning. That empowered feeling that I've had for as long as I lived here comes me having choices. And it's usually around Christmas that I'm reminded how limited I really am. In transportation, in socializing, in human experience - in ability. And I'm reminded, how much in actuality I have to rely on other people. On that entire set up that must be in place and work like a well oiled machine for someone like me to stay independent. And those are some of the things I don't like thinking about. I want to be my own man. A few weeks ago, I've had a discussion with some of my Board members. They didn't quite understand the connection I was making between feeling good about myself and being able to do things for myself. True, it might be anecdotal - but I think back to Christmas in 2008, the first time the concept of holidays in the city really dawned on me, and the first year I didn't go anywhere or visit with anyone. I'm an intelligent guy- I can reason with myself and say it's only a day, and a day doesn't matter. I'll wake up in the morning and it will be over. I had a plate of Publix sugar orange and blue frosted cookies and a season worth of "Sarah Connor Chronicles" to stream online. Yet, I felt isolated, alone and stuck and I couldn't shake that feeling. It was also at a time where I had a reasonably nice apartment in the middle of nowhere. If I get the blues today, at least I can roll around downtown. It's funny. I was here where there the buses weren't running on Sundays. I'd mostly stay home or study. Saturday bus used to finish at 5. Now we have holiday service. In a few years, I'm sure it will be running on Thanksgiving and Christmas. Gainesville is growing and I can get that feeling again. I can stay, I can go, I get to be my own person. My name is Rafal "Ralph" Strzalkowski. If you happen to practice in Gainesville, as I do, you may recognize me from my bright yellow wheelchair in which I travel all around town. In 2013, I started a nonprofit, a 501(c)(3) charity -- Florida Disability Access and Awareness Foundation – to foster greater empathy and inclusion for people with disabilities in the community where I live and work and beyond. This Foundation is my attempt to address problems that I could not easily overcome as an individual, even with my advanced law degrees. Every day, I encounter misunderstandings – expressed in stares, flawed assumptions, and a range of prejudices – with people who do not know me. My Foundation also draws attention to physical impediments to access for the disability community in public places. I want people to understand that the provisions of the Americans With Disabilities Act are not just technicalities, but have human stories – much like my own -- attached to them. Every day, people just like me are able to live their lives more fully as a result of the ADA, including not only due to the letter of this federal law, but also its spirit -- to open doors, hearts and minds to those of us with disabilities. For all of these reasons, I invite you to support our programs as we expand throughout Florida. Over the summer, we launched Wheelchaired for a Day – the Foundation’s pilot program, which allowed able-bodied people, like you, to spend twenty four hours in a wheelchair and record their experiences. Those who participated in Gainesville included attorneys and other business owners, public officials and many more. They each came back with a lot of insight, which helped me to realize that the Wheelchaired Challenge needs to continue and expand in a structured way. To learn more, please review the local news report here, which features a personal-injury attorney, Dan Vazquez – of the firm Fine, Farkash & Parlapiano -- going about his daily duties while confined to a wheelchair. I look forward to meeting you on Nov. 18! Here's a funny thing about push handles- I never wanted them on my chair. My previous one didn't have them and if I had my way- the new one wouldn't have them as well. Luckily, on the wheels I just retired last week it wasn't even an option. I've had a "lowback" while this one is a full-back. When I picked the specs eleven years ago it was intentional and I did it for a number of reasons. I was hoping having a smaller area to lean against would improve my posture, strengthen my back muscles and force me to sit up more. Unfortunately, as I learned to slide down from it it didn't quite work. I also hoped it would look more like an active, mobility device and be less "wheelchairy" as in something other people push around. Because having other people easily pushing me was the last thing I wanted to happen. It doesn't mean that on some occasions it wouldn't be efficient if they did or that there weren't times when I actually needed help. To me, someone coming up to push me, often just doing it without asking, meant overriding my independence. I didn't want to equip my chair with a tool giving other people this power. If the bars are just there, they look so inviting, right? On one level in interfered with my self image. To me, having a wheelchair that other people get to push is in direct conflict with the image I was trying to project. It was becoming more like one of those things with wheels you see in hospitals I've dreaded on my life. On another level I feared that if I gave others an easy option to push me, I'd rely on it way to often. Not having that to fall back on made me more driven, able and resourceful. I was also very happy with my Varilite custom upgrade back. So when my parents were picking out my new chair, this is a topic we discussed at great length, back and forth, back and forth. To her, bars serve a utilitarian purpose. If someone needs to push me, they should be there. I'm not quite sure who she imagined doing that and why. I don't think she can truly understand what it means to me and why I oppose it. I guess, what others see simply as equipment is more than that to me, and I don't even know how to explain it. My parents found a very nice, high end wheelchair, so I gave in on that point. I still wish the back was lower, you can hardly see me sitting in0 it from behind. And I wish I could take those handles off. Yes, you can fold them a bit, but I know they're there. but at least I have a white and shiny Tilite chair! I've had a surprise coming in earlier this week. A new set of wheels (and a shiny, white frame). My parents decided to upgrade my ride, stuck it a box and sent it through UPS. It took it an extra day or two to get here, because the delivery service after reading the description of "invalid carriage, not mechanically propelled", decided to clear it through the FDA. I guess a wheelchair still primarily is a medical device, rather than a sit with four wheels, used to move it around. It was quite stressful waiting for it to arrive while I was arguing a motion on a case in Palm City and working on putting together a fundraiser in November. I must say I'm really excited. It's only my second day in it, but it's clean, bright, it has that feeling of "new". It's like a toy, and at the same time it feels very stylish. I'm changing brands. This time - we went American. I'm replacing my Swiss Kuschall with a TiLite. I never thought a chair can make me feel this good and fashionable, but it did. Now I feel I need to make a little more effort dressing up just to match. But that's the thing. I always said a wheelchair can be a cool and stylish accessory. And this is mine. I've used my Kuschall for eleven years. I've been a fan of the brand for about fifteen. It's now torn, scratched, beaten down and patched up in places and it looks miserable. For the last few months I was practically sitting on the bottom frame support bar. 11 years ago Kuschall was my brand of choice, the one I requested by name as this is what I used in Poland. The City of Gainesville replaced my other one after a city bus run me over while I was crossing the street. And for the longest time I loved the look, the feel and the color as it became the symbol of my independence. But I've had some problems with it. It's no longer widely offered to individual customers in the United States. Finding replacement parts was always a challenge as it used its own irregular sized bolts and screws. Having things fixed was expensive and time consuming as everything had to be ordered and shipped somewhere. Rule of thumb- if you live in the United States, it might not be a bad idea to get a US build chair. It's a high end brand- I love it. It maneuvers effortlessly, it's smooth and fast. It will take a few days to figure out the mechanics of steering it, as the physics is a little different. It's lighter, it gives me less resistance so I need to hold it back more. Otherwise I run into things. I only wish I've made an unboxing video. I'm proud to say I unpacked it all myself. The box looked so tiny that I thought my parents got the size wrong, how could it possibly fit? Then I had to get out of all the bubble wrap and what seemed to be sticky food wrap tied around the frame like bandages on a mummy. It has a few pockets for storage and I know it will serve me well. But most of all, it's a new chair for a new chapter. I could probably write about things being inaccessible every day. Tales of broken elevators, of me being stuck somewhere, of people kind of caring, but not enough to do anything about it. The same angry write up every week. But then those are the things that happen to me. They happen quite frequently. I'm sorry this blog isn't more entertaining, but that's what my life is like. I face stairs and steps, buses leave me behind, I can't get places or I get upset when someone without a special tag parks in a handicapped spot. I'm on a mission, but this mission is my life. This is my world- and I started the Florida Disability Access and Awareness Foundation to change it. While I may never accomplish this goal- I will surely try. But I have no delusions. It will always be a part of my day as I am the guinea pig, the driving force, the motivation behind it. It's a vessel, a channel, a vision and a dream. And it will never be done. And I know that it's connected to me probably much more than to any of my co-workers, who listen, who understand, who encourage, who cheer along but who never truly experience- because they don't have a disability. For me a disability issue can creep up while I'm out shopping or out at the movies, or going home. And it always hits me directly. And emotions always run high. Please, please, visit http://fdaaf.org to learn more about all the ways you can help. So, what's new? Same old story. Two weeks ago I wrote about the broken lift to the cinema room on the UF Campus and I just wanted to watch a movie. Last Saturday I just wanted to get a hair cut. I'm in court on Wednesday in Palm City and I needed to look presentable. I have a person I go to every time to make me look lawyer-like. It was not supposed be a big production. I go to the local shopping center- The Oaks Mall to get a hair cut, grab some food coffee and occasionally by a T-shirt or cologne. I wasn't looking for trouble, I was just there. The bus drops you off by the entrance to Macy's. You need to take the elevator to go up the second floor to get to the mall. Last Saturday I was there to get a hair cut, but the elevator was broken. Apparently it was out of service second day in a row. My first reaction? Not this again. It wasn't that I was angry at any particular person, but I just that waste an hour and I can't get a haircut. And I have to go again. What do I do? I spoke to sales manager, I gave her my card. I told her how we want to partner with Macy's to educate them, talk to them about disability needs and the ADA. How we have an awareness program called Wheelchaired for a Day that allows the employees to experience the limited mobility perspective. We will reach out to them on Monday. And I do hope that they will reach back. Our ideas need powerful, corporate sponsors. And I hope Macy's will be on board. But how do I get in to the Mall... Getting through any of the other stairs requires rolling uphill essentially up one floor to get to the mall entrance. The next store is Dillard's, but the road is steep, I'm out in the street navigating between cars and parking lots. I don't feel safe. I will roll back, or get hit by a car, I shouldn't be out there and no one is there to help me. Luckily, half way up they yell after me from Macy's that the elevator is now fixed. Solved. For now. Until next time. Fifteen years ago I was a wide eyed law student at Warsaw University. In my third year, I've just signed up for the American Legal Center, a year long, night class for extra credit. Florida lawyers and instructors would come lecture, often a week or two at a time, to reveal a bit of this strange, new, unfamiliar legal world. It was something we craved from procedurals and crime shows, but that was real life. It seemed as if we were receiving some form of secret knowledge, although realistically we haven't really even scratched the surface, and we couldn't have with such a short program. There was something about these people, confident, engaging, with stories to tell- that resonated with my fascination with America at the time. Mike Seigel who became one of my professors at the University of Florida a few years later delivered the opening remarks. He was not talking about theories, he was speaking from experience. His tales of prosecuting organized crimes essentially blew our minds and we couldn't get enough - and a new world opened itself to us. While in the Polish law program we were used to codes and definitions- this was something that had a real life effect, that had happened, that involved real people and places - and required actual ability and skill. This was a lawyer who did what lawyers do and spoke about it. It vibrant as a film in technicolor. I think he had the most profound influence on me as later that year I went to DC to participate in the international finals of the Philip K Jessup Moot Court. 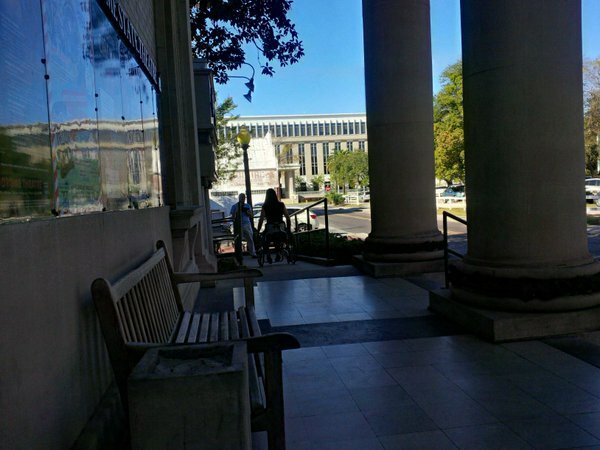 It might sound like a cliche, but with something awaken in me, something pushing to... try, I enrolled in the LLM program at UF five years later. I hope he knew that. We spoke quite a few times. We reminisced. I went to him with my immigration issues, with my admission problems, just to talk. It helped to talk. I've taken about every class he offered, either as an LL. M or a JD student. He was a horrible grader, he could really make my GPA take a dive, yet I always came back for more. Because by the time he was done with you, good grades or bad, you've had a good understanding of the subject matter, you've gotten an education. When I visited the law school this week, I've learnt Mike Seigel succumbed to cancer. He was 55. It happened earlier in the year, I just didn't know. I stopped by the Secretaries' office to chat about who was still around, who left and who got a promotion and I was coming from a meeting with a Dean. I'm looking for jobs and I'm also trying to get the school interested in teaching disability law. I haven't really been in touch. I knew he was sick, but the last I checked he was doing better and he even went back to teaching. It was really hard to get over, maybe because of my father's recent health problems as well. He was a friend and he will be missed. Disability might be a "private issue" as one of our Wheelchaired For A Day participants have said, but I won't stop talking about. It might not have any actual impact on a business' bottom line to exclude wheelchair users, but I will continue to report on it. Besides, individuals with disabilities might not be a strong and attractive consumer base or a group attractive to cater to, but just give us twenty years. The disability population is growing, the nation is aging and mobility issues concern more and more families. My point has always been that people should care more. Even if it's not something that has a strong economic impact today, notice, understand, pay attention. That's why I started a nonprofit. But here's where the problem lies: What's obvious to me may not be as clear to other people. I must say that my Creative Director has struggled quite a bit to understand how our lofty ideas translate into real world programs and solutions. What is our focus? What is the one thing that we are about that best illustrates the mission. We can't keep getting pulled in five different directions at once. What is it really about and why is that important? Why should the real world care And why I think we are best equipped to do something about it? This past week I spent on passionate debates with my Board Members with disability at its core. We were operating on a number of assumptions. We assume for example that the reason individuals with disability don't go out on their own into the world and socialize is because they don't have access, opportunities or information. I know that was true with me, but how do we know if it's not a choice for many? I could say obvious things are obvious- but I think having some solid data that looks into disability behavior can only strengthen our case. Those are some tough questions, but questions any marketer would ask me and questions I would like to have answers to. I could say - it's about me- the things I struggled with and my take on what's wrong with the world for people like me pushed FDAAF into creation- because I, because we wanted to do something about it. And then the real world kicks in. On Sunday, the Gainesville Sun published my column. I don't think I intended for it to read like a manifesto, but it could have easily be pulled out of FDAAF's mission statement. This was just about something that happened to me on a weekend. How I wanted to get somewhere and I didn't have something. "What a great illustration for your cause"- one of the emails that followed complimented and it got me to think about how all the things that we try to do at the Foundation connect and counter some of bad experiences in my life that have a disability undertones. In that sense, it's still about me, my disability and my viewpoint, because I established it to react to a host of problems I was familiar with in a way that I saw and framed the issue. I'm also currently the only person on the Board with severe mobility issues, and that does two things. It may set a direction for our vision, but also makes it difficult for others to relate to. Our Wheelchaired For A Day project in August gave me a well needed fresh perspective. For the people we asked to wheel around for twenty for hours it was a new experience. Many things were upsetting, some were frustrating. Some participants felt a new type of helplessness they were never faced with before. From getting around, to people's reactions and the limitations of having two hands and four wheels they came back often inspired an amazed. As they described some of their experiences and things they struggled with, they were eager and excited. It was a revelation to them. Rolling around is hard. Outdoors is rarely flat. People can be patronizing. Bathrooms are hard to navigate. Using a wheelchair is a workout. Some places are not all that accessible. A wheelchair can have a mind of its own. I nodded and I smiled, thinking to myself- this is what I've been experiencing all my life, I hardly even notice. A week ago I was faced with a broken wheelchair lift to the auditorium on campus. And I must say, that if it wasn't for my Director of Communications Susan who started an email campaign about it on the phone I would have probably not done anything about it myself. I would have probably said, these types of things happen, what can you do- elevators break down. I would have probably made sure that the manager knew about it but then expressed my frustration and gone home. It was simply not meant to be. The malice of inanimate objects. I'd need to find another way to entertain myself. But then I started to realize, that somewhere in the process of becoming thick skinned and understanding I started making excuses for other people. I begun to settle. I started accepting limitations far beyond the ones that my wheelchair puts on me. Some things are not "all right" because they are simply "not OK" regardless of how new you are to the wheelchair experience. There are things that I must get angry over today, tomorrow, ten years later, although it might be more comfortable and easy to just let it slide. I know I've said before that if I got angry over every single thing that happens to be I'd be fueled by emotion every day. Somewhere in there you need to find balance. But if I don't get upset over things that I see, who will? Where will the change come from if I choose to look the other way? And what point have I reduced myself to practically apologizing for my own existence? Letting things go, getting used to them because otherwise they would heat up goes against how I was raised and what I was taught. There are no medals for just being patient, learning to accept the status quo, biting your tongue and doing nothing. So perhaps instead of thinking "Oh, they're new to this, naive, they'd learn if they had to do it longer" I should be more like them, frustrated, taking note, seeing and thinking. In that way this experiment was a learning experience not only for them but also for me. Maybe I should get back what I have so obviously lost? I've had a stressful week. The next didn't look much better either, so I decided to get a load off my mind by seeing a movie on campus. Double feature Saturday. Get some popcorn -and none of that healthy stuff- and relax for a few hours with a bottle of a cherry cola. I really needed a break. When I get to the cinema room at the student union building, the first thing I notice is that the lift that takes me over the stairs and to the door is all the way up. At first I think that they have another patron in a wheelchair, or- what they occasionally do- they were bringing some equipment down. I try to get it down but the button isn't working. I see a man from the catering services rolling a cart with dishes around to see if perhaps the door at the top is slightly open. It happens sometimes, it won't run until it's tightly closed. He opens it, slams it, goes in, tries to run it from the inside, yup, not working. The projectionist comes out, plays with the buttons for a bit, can't get it to work, calls the building manager. The building manager comes up, looks at the lift, tries to operate it by going in, but and again- it's not working. Then he remembers that there was something about it being broken the day before. But they "wrote it up" or they called it in. When would it be fixed? Coming here on Sunday wouldn't be exactly ideal for me, because the buses don't really run, but the movies only play for one more day. But no, not Sunday. Next week. Perhaps they can get someone out there as early as Monday. (Here's to hoping). The building manager is apologizing, but he doesn't know what to do. A few stairs became the impossible barrier. I came here for nothing. I won't get to see the 2 pm movie or the one at seven. or anything on Sunday. I knew he wouldn't suggest that a group of students lift me up, because everyone is so afraid of liability, should something happen to me. Reitz is after all the building where I was told by the staff to go wait in the staircase on the second floor during a fire alarm evacuation and nobody cared to help me down. Thank God it wasn't a real fire. He then suggested I could peek through the other entrance. I wouldn't be able to go in, because it had three small stairs down, but I could see, from the side - perhaps 1/3 of the screen. And I could hear it. I guess hearing it is the most important thing about watching a movie. And again, three tiny steps got in my way of getting in. I even thought of crawling out of my chair and just getting into the room. If only there was a portable ramp they could put over the stairs. The solution was that simple! But that didn't happen, the building manager apologized and I was really upset and I said, "Thank you, I wish I could say it's OK, but it's really not". Here's what really upsets me about that whole situation. It's not that I couldn't get into one movie, that one time. It's that it became perfectly acceptable for something labeled "accessible entrance" to be out of commission not for an hour, not for a day, but at least three days, and nobody sees it as something essential, something that an entire group of people needs and uses to make use of a campus facility. Wait until Monday, Monday-if we're lucky, maybe longer, and nobody seems to see it as a priority or is looking for any solution. Perhaps it will be fixed Monday, but what good does it do me if there's no movie that day? It's a upsetting that all they can do is "write it up" like a broken light bulb or an electric door opener, things that you can typically afford getting to to when you get to them. It's also disappointing that "accessible entrance" as the stick on the lift says, is routinely used to transport speakers and equipment. Something meant for people - exposed to a greater chance of breaking down. So much for disability access at UF. It's event like this that cut Florida Disability Access and Awareness Foundation's work for us. Because we need the access. And definitely more awareness. The lawyer resume format: Have we've been doing it all wrong? My Foundation's Creative Director reviewed my resume recently and she was shocked when she saw its structure. Nobody's going to hire you if you present it like that, she concluded. What she didn't know was that it was actually more and less how an attorney's (or law student's) resume is supposed to look like. This was how my Career Services contact revised and show me to do it during my first year. And this how everybody else has been doing it- I showed her samples from schools like Yale, although shorter than mine. But why? Here's where the problem is- on a "legal" resume education goes first, before experience. And this is something that hasn't been sitting well. It looks as if my degrees are my biggest accomplishment. I guess with a typical applicant it doesn't make much of a difference. They list the college they went to for undergrad ans above it - where they got their JD. Two to four lines max, and then you get to the meat and potatoes. I have three law degrees from two different countries, I participated in conferences and competitions, I finished two foreign centers of foreign law, I have Dean's lists and Book awards and scholarships. You have to read through half a page of text before you get to any experience and that might be impressive if I looked for a career in academia, not law practice. You need to feature your biggest asset she said - and that is where you worked previously. That's why typical resumes/CVs have it in the reverse order. Work is more important than school. And I guess because this section was intentionally intended to be short- just a quick glimpse at a school name to get the idea about what to expect, for most people it makes no difference. I do think with me it pulls focus away from what I wanted to feature. And the same time I don't want to remove entries from my resume, as I'm proud of all of them just so it can have a better flow. So here's where my problem is: On one hand II know that "the other type" of resume would suit me better upon reading. On the other it could reflect on me poorly. This is what my industry expects, not following the standard, the protocol, the accepted format makes me truly look like a novice. I might as well just print it on a pink scented paper and sign it with a pen with a fluffy tip on top like the character from Legally Blonde. Sure, it would give me attention, but would it be for the right reasons? When you read through some of the job postings they seem to test the candidates on their ability to follow instructions. Answer these questions in a reverse order in your cover letter, one of them said. On the other hand do I risk being completely overlooked if I don't give myself the edge? Shouldn't all communication be purposeful and if I'm running the risk of sacrificing content for format and not presenting myself in an effective way, don't I lose either way? That format was adopted for a reason- a reason presumably other than just following it blindly on a set of presumptions. Presumptions that worked for many but not all. At one point adherence to a standard not only overweighs communication but hinders it. What should happen then. On a personal note, it got me to think, although I never have the courage to do it, I have so many things stacked up against me. I'm in a wheelchair, I'm a foreigner, but I'm educated and I'm creative. And I just want to practice law. Or educate people about it. Maybe being a bit outside of the box can't give me more of a disadvantage that my life already has. Perhaps I shouldn't fear featuring my assets, because no matter what I do I will always be different. I will never understand while the Florida Bar believes that someone straight out of law school is more qualified to advise clients on legal matters having taken the exam just a few weeks earlier than someone who actively practiced in another State for many years. I also have hard time grasping why attorneys who have taken the Bar exam in another American jurisdiction, passed it, then made a living working in the profession within a legal system very similar to ours are treated as if they practiced law in another country. The only thing that cures that is of course- taking a two day exam side by side with recent graduates. Here's where I think we lose sight when talking about reciprocity and whether or not Florida should adopt it. We're not talking about opening the floodgates and swearing in everybody who just wants to practice law. We're not talking about allowing people without Juris Doctor degrees to sit for the bar. We're not talking about abandoning the requirement that the schools running those programs be ABA approved. Some jurisdictions do allow foreign LLM graduates to take the exam. Others make provisions allowing formal legal education substitution. But- at the same time- States that do that have the reputation of having some of the hardest exams in the country. And I say - good luck to applicants trying that route, they will need it. And I say that- in the interest of full disclosure- as someone- who after graduating with a law degree from a different country and an LLM from Florida, actually went back, got his Juris Doctor, took and passed the Florida Bar exam. I'm a Florida attorney- but also taking advantage of the admission on motion rules in DC- a Washington DC attorney. Being sworn in and practicing in DC opens me up to reciprocity in a large number of under States, that Florida itself didn't. It just takes longer. So, here's where the bottom line is for me- all of us (or most) went to ADA approved schools following the same guidelines. We've taken exams that had the same parts like the multistate section day or the MBE. We were also required to pass the ethics exam- the MPRE, on which I hate to brag I scored pretty high. The only thing that is truly different is the "state portion", on which we write essays and solve multiple choice tests. But even then large amount of what we have to express is still pretty similar. With some "state distinctions" we have to memorize over the multistate concepts. Often in review classes they are taught more as an afterthought, or a list we have to memorize. So, what is it about Florida that makes it more hermetic in how it administer the admission to the legal profession, how are we more unique than New York or Illinois. And are we really helping the clients or just keeping the gates closed for those that are already in? And I understand that the Bar needs to set the standards for admission and monitor the quality of the services rendered. I just don't think that sealing itself from the rest of the country, ignoring the talent and experience of all those other lawyers is the proper way to do it. I know- there's ninety thousand of us. And if Florida offers any type of reciprocity- there will be more. Some of us have a hard time getting legal work as it is. I know that traditional law firms have not been exactly rushing to hire me either- but it is a time to adapt. When somebody asks me how to go about locating a lawyer, I often tell them to find someone experienced and local. Yes, I know some people collect jurisdictions like badges, but to me it's never about how you got your Bar card, but are you physically there. Have you dealt with the peculiar ways courts in your area do things and can you assist someone if a matter escalates. Ten, eleven bar memberships may look impressive on a resume- and if you're willing to move here- great. If not, I don't think it speaks much about your ability to help a Florida client. Wheelchaired Anger- for somebody else. The response to our Wheelchaired For A Day challenge from the disability community has been overwhelmingly positive so far. In a manner that feels more like punishment or payback some have pointed out, that now the able-bodied get to experience what they've had to endure for years. Finally, someone will show them what it's like type of feedback. Others have asked about the program guidelines and how to launch it in their city. That their city should be next- a reaction we got from places across the country. The only people who have not gotten it and have a hard time getting it still, are the ones who themselves can walk. And this is strangest thing- those are the people that typically have a brother, a father, a best friend who is in a wheelchair. Through interaction or osmosis they believe they have absorbed the disability perspective without having to experience it themselves. They watch from the outside, so they assume they know what it's like. Yet, they refuse to try it and find out for themselves. Because they feel that being curious about what it's like is wrong. Like it takes away from what the brother, father, or friend experiences. These are the people that get outraged- but somebody else's behalf. And I have no use for that. I mean if a person in a wheelchair reached out to me and said- I don't like it when someone who walks tries to experience what I go through we could definitely talk about it. But when you get upset over experiences of other people because you assume you know what it's like, not something you know first hand but your interpretation of it, what you believe a person in a wheelchair should feel, well I don't know how to argue with that. Because I draw from my own life, things that actually happened to me and how they made me feel. I know I don't get enough understanding and empathy from my community for these types of causes so I'm trying to built up what I'm missing. The best way to have someone think of something is not talking to them about it, it's having them experiences. Those who refuse to do it because of the father, the brother, the uncle or a friend basically see a wheelchair as a taboo, as something shameful, as something we must tolerate because there's no alternative- but it seems to me, whether they admit it or not- they feel that being in a wheelchair itself is shameful. Most recently, our Drag Queen participant was nearly denied admission to the club and the DJ threatened to not play her music. And you have to wonder: What is this pushback? Why are those angry, negative reactions from non-wheelchair users so strong? Is it because they fear it? Is it because they see it as something final, they point of no return? I see it as a tool. One that helps me get around. Wheelchaired: Ending on a high note. When you do a project for a month a certain routine an arrogance kicks in. But then life once again teaches you a lesson, brings you down and makes you humble. Last week we were set to interview two of our last Wheelchaired for A Day Challenge participants. We were all tired and stressed and then figuring out the schedule to have them come in and share their experiences became an issue. The logistics of picking up and dropping off the wheelchair really takes a toll on you after a while- especially since one of them asked not to be filmed on the first day and then both got sick and we were texting frantically back and forth to figure out who was coming back and when with a new scenario emerging every twenty minutes. I appreciate all of the people who took the Challenge, I really truly do. The stories that they shared were incredibly and surprisingly moving and some of the footage they shot was mind blowing. But we were ready to be done and I have to say, with all the complications a thought crossed my mind and I said to myself :"Do we really need it?" In my own arrogance I thought, "Well, maybe they don't need to come back, what can tell me, what can they show me that a drag queen and a Mayor of a local town haven't?" "How can you top that?" And as it turned out, in their own way, they did. We also thought we may have made a mistake scheduling two trauma nurses in a row, once again, wrongly assuming their experiences would be similar. My project manager, Susan felt we should finish the month by getting a teacher to do it, but we didn't give him enough time. And there was a slight disappointment- between all the hot and humid weather and riding on two city buses to get there she wanted to make the last one powerful.As we plan to expand the challenge into schools we thought this would allow it to end on a "high note". As a preview of what may come. But we did end on a high note, because we were not prepared for what the nurses told us. Often we gear up for yet another routine interview, but then something happens that blows us away. And I'm not just saying simply because everybody's story is important and everyone's perspective brings something new, which is all true. Both of our nurse participants live together and work at the trauma unit. First one told us about her grandfather who had polio and worked for NASA. They way she remembered him was always in his wheelchair, that was his normal state for her. And he arranged his entire workshop so he can operate it from that position. She then decided to get a sense of what it must have been like for him so he took the chair to do crossfit. As if that wasn't moving enough her roommate told us about her work. Since they live and spend most of their day together we thought their stories would be similar. Boy, were we wrong! She told us that as a neuro trauma nurse she sees a lot of people coming in with injuries. On many occasions she knows that her patients will need a wheelchair for the rest of their lives even before they do. For her, it was a gesture of solidarity, but also to get a feeling of what that perspective would be like, although for them it's not a day and not something they signed up for. We were blown away by that statement and it's unlike anything any of our other participants could ever told us. We can't wait for all our videos to come our you will then understand- we could not have hoped for a better outcome. But then- that's our life lesson: Don't get jaded- you might just be amazed if you let yourself be surprised, and don't ever stop being humbled by what others share with you. Let me make one point clear: We were ecstatic when Chastity Rose, one of the most recognizable Central Florida drag queens agreed to spend a day in a wheelchair and then perform in it. I felt it sent a really powerful message about community coming together for an important cause. A community after all has different groups, that may not see eye to eye, but at the same time it's so much more than a sum of it's segments. We needed a strong presence in the LGBTQ segment and we got it in the form of a loud, unapologetic, fierce performance. There was never a thought in my- or any of my board members' minds- that it may be inappropriate. We realized that for some people it may be too much, but then- not everybody will have the same appeal to everyone else. The mission was always clear- to have people of different backgrounds come together for this project and incorporate a wheelchair into their lives. The only genuine concern that someone has was whether Chastity would approach the project seriously rather than as a prop to boost her performance. But here's the thing that nobody thinks about - and I often don't know how to express it without making it sound depressing. Disability can happen to everybody. You can be of any gender, race, color, religion, gender, profession- you could be walking one day and using a wheelchair the next. Our hope for anyone that finds themselves with a mobility restriction is that they would be able to go on with most aspects of their life as usual, to maintain the same level of social interaction, passion and character. What Chastity has done for us - and I hope this will become more evident when the video comes out- was to show that regardless of people's often shocked reactions it's OK. A wheelchair is a vehicle, it's a tool, it doesn't change who you are. So when somebody said, maybe it would feel rude, in your face, offensive perhaps, I thought I certainly hope so- Chastity Rose is a fierce performer who knows how to get her message across. If she's that way without a wheelchair I certainly hope she wouldn't be a different person when she needed one. We are all different people and we should all live our lives in ways allowing us to express ourselves best. Let's not give wheelchairs too much power to transform who we are. If at the same time we are able to generate some buzz, raise a couple of eyebrows and get people to talk, great- sometimes you need a stunt of sorts to get the ball rolling, because the issue is much bigger than Chastity's heels that night and more controversial that the title of her song. For our last minute press release our media list included The Advocate, Out Magazine, Queerty and The Rolling Stone. It was interesting- in the perspective of everything that happened that night, including- our headliner almost not being let into the club because of the wheelchair and Chastity's really thoughtful remarks- how everything we do as part of this project suddenly gets this new depth. It was so much more than just a performance, which would have been fine if that's all it was, because we need a bit of light spirited context as well. But that is a story for another day. Visit http://wheelchairedforaday.org to read more about the program. Visit http://fdaaf.org to learn about the foundation and ways you can get involved and support it. planning her Saturday night show at the University Club around the Wheelchair Challenge. “Officially, hell on wheels,” Della Cruize said of her decision to accept the Challenge. Special thanks to NuMotion for loaning a state of the art wheelchair for the Challenge!